Can the Japanese prime minister address the past and provide a vision for future cooperation? History will be made on April 29. 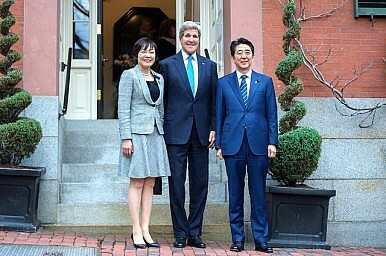 For the first time, a leader of Japan will address a joint meeting of Congress. Such recognition of a critical U.S. ally in Asia is long overdue. Japan’s phoenix-like rise from the devastation of war is a testament to the country’s policymakers and citizens. It has blossomed into a vibrant democracy and the world’s third largest economy. Yet amidst the excitement of Prime Minister Shinzo Abe’s U.S. visit, there is also some trepidation over the degree to which he will handle still contentious issues of history. There is much ground for Abe to cover in his address. During the last 70 years, Japan has been an exemplar of a responsible nation. Eschewing the violent militarism that led to catastrophe in the 20th century, Tokyo embraced passive foreign and security policies. The bilateral alliance has been a linchpin of American national interests in Asia, including maintaining peace and stability. But Japan has come to depend upon the United States for much of its defense. Washington has long urged Tokyo to assume a larger role for its own defense and to be more active in addressing regional and global security concerns. Abe has overcome Japan’s national lethargy to fulfill some long-promised revisions to its national security posture. Indeed, Abe’s visit is expected to coincide with the announcement of revised alliance guidelines, the first since 1997. The revisions will build on Japan’s foundation of good behavior and incorporate the country’s growing security capabilities. One key tenet is Japan implementing “collective self-defense,” the ability to help defend those nations who are defending Japan or engaging in UN peacekeeping operations. The United States welcomes these changes, seeing the ability to work more closely with its Japanese defense partner as beneficial to both nations and the region. Japan’s troubled past, however, makes its neighbors wary of any change to the country’s Self Defense Forces. Tokyo and Washington have endeavored to explain how Japan’s security changes, well-rooted in the U.S. alliance and in concert with U.S. forces in Japan, pose no threat to the region. A more expansive public diplomacy is called for to dispel many misperceptions which have taken root. Though speaking to American lawmakers, Abe’s audience will be far larger. His Asian neighbors will be listening closely, as well. Thus, he will need to assuage regional suspicions and animosities arising from perceived Japanese “backsliding” – their sense that Japan has not atoned sufficiently for its wartime actions. Japanese tensions with China and South Korea are typically cyclical, with periodic flare-ups, but the situation has deteriorated precipitously in recent years. Questions linger about Abe’s “true intentions.” He has affirmed previous administrations’ statements of remorse for Japan’s wartime aggression and coercion of women into sexual slavery – euphemistically referred to as “comfort women.” Yet Abe and other policymakers have questioned the evidence upon which those statements were based. But Abe is unlikely to dwell on these issues in an American setting. Yes, his U.S. audience would welcome acknowledgement of the past, combined with praise for the bilateral alliance and U.S. defense of Japan. But Americans generally have no expectation of receiving extensive apologies for actions taken before Abe was born. Indeed, such expressions could be seen as reopening old wounds. Yet, Japan’s neighbors, most notably South Korea and China, might perceive Abe not addressing their bilateral historic issues during his U.S. visit as reflecting a revisionist view of the past. Such an interpretation would exacerbate ongoing regional tensions and further complicate U.S. security interests. Abe faces a tricky situation: his speech will be dissected for what he says and doesn’t say. It is proper for Abe to highlight Japan’s accomplishments during the 70 postwar years and his country’s intent to play an even large role in addressing future security challenges. But the prime minister should also embrace the opportunity to unequivocally affirm support for Japan’s atonement for the past. He should, for example, include key phrases from the Murayama and Kono statements if he hopes to facilitate reconciliation with Japan’s neighbors and expand his country’s global role. Abe’s speech to the Australian parliament last July provides a model for his Congressional speech. In Canberra, Abe’s reference to two painful Australian memories of World War II earned praise and helped to cement stronger bilateral ties. The reconciliation of Japan and the United States – once the bitterest of enemies – provides an encouraging example that even difficult and painful differences can be bridged. Let’s hope that the Japanese prime minister uses the Congressional podium to both address the past and provide a vision of cooperation for the future.